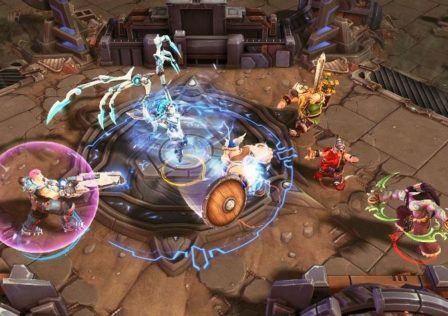 Since my previous post, (https://www.reddit.com/r/heroesofthestorm/comments/66ypeb/f_heroes_of_the_storm/), received a lot of positive reception and comments; I believe I owe it to the community and Blizzard to bring forward some concepts around those F heroes. Y'know to motivate them to incorporate the much needed F Heroes into the Nexus. Without further ado, please read below. > **(Passive) Jealous Widow:** Faerlina automatically hurls poison at nearby enemies who use their abilities, damaging them instantly. > **(Q) Poison Bolt Volley:** Faerlina hurls poison that hits enemies around her, damaging them over time. > **(W) Rain of Fire:** Faerlina marks a target area upon which fireballs land randomly. Enemies hit by the fireball take initial damage and then also damage over time. > **(E) Frenzy:** Faerlina gains increased movement speed, attack speed and attack damage temporarily. > **(R1) Toxic Shot:** Faerlina strikes her target with a decisive stab, dealing damage equal to a percentage of their current hp. > **(R2) Finishing Blow:** Faerlina strikes her target with a decisive stab, dealing damage equal to a percentage of their missing hp. > **(Passive) Rise Footmen:** Every few seconds, Falric spawns a ghostly soldier that moves forward in lane and charges to shield bash first enemy hero in sight, damaging them and slowing them. The foot soldiers can be killed by damaging them past their health and do die instantly after shield bashing an enemy hero. > **(Q) Quivering Strike:** Falric lunges forward towards a target enemy *(almost in the fashion of Dante's Stinger move from Devil May Cry)*. Upon contact, the target is mini-stunned *(0.1 seconds duration) and takes moderate damage. > **(W) Impending Despair:** Falric inflicts a sense of fear in the minds of nearby targets (in a small circle around him). As a result, they take moderate damage and fear away for 0.5 seconds. > **(E) Counter Shield:** Falric digs his giant shield into the ground and stands firmly behind it for 0.75 seconds. Any abilities directed his way are absorbed and the inflicters are punished. They take moderate damage and are stunned for 0.1 seconds. > **(R1) Hopelessness:** Falric targets an enemy to weaken them for 5 seconds. During this time, all healing they receive and all damage they do is reduce by 50%. > **(R2) Defiling Horror:** Falrics lets out a scream in a small circular area around him that latches onto all nearby enemy heroes. Latched heroes are slowed for 1.5 seconds and if they do not cleanse or distant themselves from Falric before the slow expires; they take moderately high damage and are stunned for 1.5 seconds. > **(Passive) Concentration:** Damaging Fandral puts a Concentration stack on the enemy. Damage from Fandral consumes all concentration stacks and deals bonus damage based on the number of stacks consumed. > **(Q) Cat Pounce:** Fandral takes the form of a cat and pounces on the enemy, dealing damage and leaving an fiery circle where he lands. Enemies that stand or walk through within the fiery circle take damage over time. Fandral in cat form runs and attacks faster but takes increased damage. > **(W) Scorpion Sting:** Fandral takes the form of a scorpion and spreads toxin in an AoE around him. Enemies hit by the toxin take damage over time. Fandral in scorpion form runs and attacks slower but takes decreased damage and his attacks deal Damage over time. > **(E) Elf Fiery Cyclone:** Fandral hurls a tornado in a line. All enemies hit by the tornado take damage over time and are knocked up. > **(R1) Searing Seeds:** Fandral's spells implants fiery seeds in the targets for the next few seconds. Seeds grow within targets for a few second before exploding and dealing massive AoE damage. > **(R2) Burning Orbs** Fandral summons an orb around each enemy hero that deals damage over time until it expires or is destroyed. > **(Passive) Sniffles:** Low health enemy heroes within a large distance to Fang are revealed to him. > **(Q) Rabid Biting:** Fang bites target, damaging and stunning them for the duration (while also channeling for the same duration). Stun, silence or dis-positioning Fang (or opponent) will end the biting prematurely. > **(W) Frightening Howl:** Fang lets out a howl, temporarily slowing the movement speed and attack speed of nearby enemies. If the enemies have their back towards Fang at the time of the howl, the reduction is doubled. > **(E) Canine Leap:** Fang leaps to a target location, dealing damage to the closest enemy upon landing. > **(R1) Grow:** Fang passively gains increased movement speed, attack speed and the cast range of all his non-heroic abilities. > **(R2) Lone Wolf** Fang temporarily gains stealth, movement speed and his next basic attack out of stealth deals immense damage. > **(Passive) Well Well Well:** Fara regenerates all mana and health a well has to offer instantly instead of over time. Additionally, she can also drink from the well twice as often as other heroes. > **(Q) Smite:** Fara charges at an enemy, damaging and stunning them upon impact. > **(W) Zeal:** Next few attacks for Fara deal increased splash damage that also hurts nearby foes. > **(E) Blessed Hammer:** Fara throws her holy hammer that spirals around her a few times before disappearing. Enemies hit by the hammer take damage. > **(R1) Holy Bolt:** Fara sends out a massive lightning bolt that damages all enemies and heals all allies it passes through. > **(R2) Humility** After a brief delay, Fara sends out a light around her. All enemies hit are temporarily Smitten. Smitten enemies aren't silenced or disabled but deal immensely low damage from their attacks and abilities. > **(Passive) Electric Link:** Pressing D on a nearby ally links Feugen to them. A portion of the damage taken from the linked ally is reduced and taken by Feugen instead. > **(Q) Magnetic Pull:** Feugen damages and pulls an enemy close to his linked ally. > **(W) Static Field:** Feugen becomes statically charged for a few seconds, damaging all nearby enemies every second. > **(E) Electric Clap:** Feugen's clap sends out an electric shockwave in a cone. Enemies hit by the shockwave take damage and are electrocuted. Electrocuted targets are stunned for a given period or until they take damage from a new source (already afflicted DOTs won't end stun prematurely). > **(R1) Summon Stalagg:** Feugen calls Stalagg to the battleground. Stalagg has increased attack speed and movement speed and is aggro'ed towards enemy heroes nearby Feugen. Stalagg keeps fighting until killed. (Note: Level 20 talent. If Stalagg is alive for 5 seconds after Feugen has been killed, Stalagg will summon Feugen with full hp). > **(R2) Tesla Coil:** Feugen conjures a Tesla Coil on a target location that takes a few seconds to charge. After which, it damages all nearby heroes each second until it expires or is destroyed. > **(Passive) Grizzly:** Fiacla-Gear is surrounded by a Grizzly bear that attacks any nearby enemy. > **(Q) Firestorm:** Fiacla-Gear sends forth three lines of fire that weave in and out of each other, damaging and burning enemies. Burned enemies take damage over time. > **(W) Artic Blast:** Fiacla-Gear hurls a massive ball of snow that damages and slows the first enemy hit. > **(E) Twister:** Fiacla-Gear points to a target area that becomes windy after a brief delay. Enemies hit by the cyclone take flight, are stunned and take damage upon landing. > **(R1) Werewolf:** Fiacla-Gear temporarily turns into a werewolf. During this time, his movement speed and attack speed is increased. Additionally, he is immune to slows. Read: What's the best, most "selfish" heroes for climbing? > **(R2) – Werebear** Fiacla-Gear temporarily turns into a werebear. During this time, his health and attack damage is increased. Additionally, his third attack on the same target briefly roots them. > **(Passive) Permanent Cloak:** – Finja has no mana, only cooldowns for his abilities. Finja gains stealth when out of combat for 3 seconds. Taking damage, attacking, using bbilities, or channeling reveals Finja. Remaining stationary for at least 1.5 seconds grants invisibility. > **(Q) Back Stab:** Finja appears behind target, dealing damage and mini-stunning for 0.1 seconds. > **(W) Smoke Canister:** Finja tosses a smoke canister at a target location. Enemies inside are slowed, take damage over time, lose allied vision and have reduced vision. > **(E) Shadow Jump:** Finja blinks to the target location. Using this ability does not break cloak. > **(R1) Shadow Mark:** Finja disappears to convert into 5 shadows around the target that converge onto it. Any enemy heroes hit by the converging shadows take damage and the main target takes higher damage than the collateral victims. > **(R2) Ninja Recruitment:** Finja spawns a murloc at every live enemy hero, which lasts for 5 seconds and continue to target said hero. These murlocs can be killed. Finja can assume the position of any live murloc by reactivating the ability and clicking on them. > **(Passive) Adventurer:** – When Finley drinks from the fountain, all allied heroes receive the regeneration. Finley has 3 basic abilities for each basic ability slot and only one takes place of each slot randomly. Upon every death, his basic abilities may shuffle. > **(Q1) Fireblast:** Finley hurls a fireball that damages the first enemy hit and they burn for DOT for 3 seconds. > **(Q2) Steady Shot:** Finley shoots an arrow that hits the first enemy hero for damage and 80% momentarily slow them for 0.5 seconds. > **(Q3) Dagger Mastery:** Finley equips two daggers. His next two basic attacks have minimal ramp up, maximum attack speed and deal additional damage each. > **(W1) Lesser Heal:** Finley heals self or nearby allied hero. > **(W2) Armor Up:** Finley and nearby ally gain a temporary shield. > **(W3) Life Tap:** Finley loses a percentage of his health but grants mana to nearby allies. > **(E1) Reinforce:** Finley summons two murlocs that push lane on his behalf and prioritize enemy heroes. > **(E2) Shapeshift:** – Finley temporarily gains movement speed, attack damage and a shield for 3 seconds. Finley’s next attack during this time ends the bonuses prematurely. > **(E3) Totem:** Finley may summon either a healing totem, searing totem, air totem or stoneclaw totem at random. Totems last 5 seconds, can be destroyed prematurely by attacks and grant Finley and allies the following bonuses if they are within their range. * Healing Totem – Finley and allied heroes are healed each second. * Searing Totem – Finley and allied heroes gain increased attack damage. * Air Totem – Finley and allied heroes gain increased spell damage. * Stoneclaw Totem – Finley and allied heroes gain armor and magic armor. > **(D) Shuffle Skill:** Finley can shuffle one of his basic skills by pressing D and then the skill slot he wants to shuffle. *For example, DQ will shuffle his Q ability between the three skills. > **(R1) All Three:** Finley next basic ability activates all three spells in a specific slot irrespective of which one is currently occupying the space. For example, pushing R and then Q – click will make Finley hurl a fireball and arrow in the same direction meanwhile equipping blades simultaneously. **(R2) Catastrophe:** Finley randomly shuffles around the abilities of all enemy heroes for 5 seconds. *For example, enemy Valla may retain her Q ability but get her ally Tyrande's W instead of her own W*. > **(Passive) Burning Rage:** Fizzle gains increased spell power the longer he is in combat, up to 250%. Bonus spell power is lost when out of combat for 7 seconds. *Note – Fizzle is extremely squishy, so this is a risk-reward passive*. > **(Q) Firebolt:** Fizzle shoots a bolt of flame that damages and burns (DOT) all enemies it passes through. > **(W) Fire Shield:** Fizzle places a Fire Shield on self or allied target for 5 seconds. The shield absorbs incoming damage till an hp threshold. If Fire shield is damaged past the hp threshold, it will explode, ending prematurely but damaging all enemies in a large radius. > **(E) Elusive Jump:** Fizzle jumps in place, becoming airborne for 0.5 seconds. During which time, Fizzle is immune to all damage, CC and untargetable. Fizzle has 3 charges of the Elusive Jump. > **(R1) Imp Assist:** Fizzle sits atop a shoulder of an ally for 10 seconds – becoming untargetable, invulnerable to damage and CC for the duration. Fizzle can dismount ally prematurely by reactivating the ability. During shoulder mount, Fizzle can not issue move commands or basic attack commands but can use spells. Elusive Jump is disabled during ally mount until storm talent is learned – at which point, the mounted ally becomes airborne upon activation of the ability – becoming untargetable, immune to all damage and CC until landing after 0.5 seconds. > **(R2) Impception:** Fizzle calls out a few of his fellow imps around him, who basic attack nearby enemies – prioritizing heroes. Damaging non-Fizzle imps makes them explode, dealing damage in an AoE. > **(Passive) Divinity:** After every spell use, Fjola shrouds herself in a protective bubble that completely negates the next basic attack from an enemy hero. > **(Q) Light Vortex:** Fjola channels a beam of light at target for 5 seconds, dealing progressively increasing damage over time. > **(W) Surge of Light:** Light emanates out of Fjola, light-blinding all enemies for 2 seconds. Light-blinded enemies not only miss all their attacks but also have their in-game screen completely white and their in-game sound muted for the duration. *Note: See Smite Ra's second ability for reference*. > **(E) Shield of Light:** Fjola temporarily gains a Light shield that absorbs incoming damage. Shield can be destroyed by dealing too much damage. While shield is active, Fjola is CC immune. > **(R1) Touch of Light:** Fjola illuminates an enemy hero for 5 seconds. Illuminated target is revealed for the duration and takes miniscule DoT damage. After the illumination expires, all damage done to the target during it being lit up is immediately re-applied. > **(R2) Call Eydis Darkbane:** Summons her sister, that mimics Fjola's commands. Only difference is that her spells are dark and her passive let's out darkness in a circle which damages enemies instead of protecting herself. > **(Passive) Empowered Boom:** After every 5 attacks or using an ability, Flark loads an empowered rocket in his boom cannon. The next basic attack explodes on impact, dealing AoE damage and stunning all damaged enemies for 0.1 second. > **(D) Flight:** Flark uses his backpack rockets to levitate, gaining terrain-walking and CC immunity at the expense of 20% reduced movement speed and taking 20% increased damage from all sources. > **(Q) Sticky Bomb:** Flark throws a bomb at a target location that automatically detonates after 3 seconds. Sticky bomb can be detonated earlier by reactivating the ability. Enemies hit by the explosion are damaged. > **(W) Flash Bomb:** Flark hurls a flash bomb that explodes on impact. Enemies hit by the flash bomb are blinded, have their screens turn completely white and in-game volume turned off for 3 seconds. *Note: See Smite’s Ra 2nd Ability – Divine Light – for reference*. > **(E) Pushplossion:** Flark flings an explosive charge that detonates after 3 seconds, or when this ability is activated again. The explosion deals damage to enemies, knocking them away. Flark is also knocked away, but takes no damage. *Note: See League of Legend’s Ziggs 3rd Ability – Satchel Charge – for reference*. Read: A big thank you to the HotS team for acknowledging Genji needed to be seriously looked at. > **(R1) Goblin Bombs Everywhere:** Flark hurls a plethora of goblin bombs at the target location that deploy after 0.5 seconds. Once deployed, enemies that enter their proximity denote them. Denoted goblin bombs deal damage in AoE and stun enemies for 0.1 seconds. > **(R2) Massive Boom:** Flark levitates over 1.5 seconds, gaining CC immunity and taking 20% increased damage from all sources. After 1.5 seconds, Flark shoots out a massive rocket from his boom cannon; forcing him to get knocked back a substantial distance. The rocket explodes at target location, knocks all enemies away from the center and deals massive damage to them. > **(Passive) Precision:** Repeated consecutive basic attacks from Flavie deal increased damage. > **(Q) Fire & Ice:** Flavie toggles between ice imbued or fire imbued weapons. Every third attack from ice infused weapon slows enemies and every third attack from fire infused weapon burn enemies to take damage over time. > **(W) Charge Bolt:** Flavie lets out lightning that damages 5 enemies simultaneously, prioritizing heroes. > **(E) Teleport:** Flavie blinks a short distance. increased attack speed and movement speed. > **(R2) Stone Curse** After a brief delay, Flavie temporarily turns her target to stone. Stoned target is stunned for the duration and takes increased damage from all sources. > **(Passive) Flobbidinous:** Upon taking fatal damage, Floop turns into a blob for 4 seconds. The blob can be destroyed by damaging it. If the blob is not destroyed until the end of the 4 seconds, Floop respawns with hp at the same percentage as the surviving blob. > **(Q) Vial Toss:** Floop tosses a poisonous vial at the target location that explodes in an AoE to deal insane damage to foes but a portion of the health lost is healed back over a short period of time. > **(W) Elastic:** Floop becomes super elastic for 3 seconds. During this time, 75% of the damage done to Floop is reflected back onto the inflictor. > **(E) Jelly Hop:** Floop channels to jump in the target direction. The longer the channel, the longer his jump distance becomes. Upon reactivating, Floop slingshots at the target location. Enemies hit by Floop during landing are slightly knocked back and slowed for 2 seconds afterwards. > **(R1) Jelly Formation:** After 2 seconds of channeling, Floop temporarily transforms into an allied or enemy hero for 20 seconds. In this form, Floop gets all the talents and abilities of the target except heroic ability. Floop can transform back to his real form by pressing D (or 1). > **(R2) Sticky Splatter:** Floop explodes into goo that covers a large radius for 4 seconds before reforming back. During this time, Floop cannot use any action and is invulnerable. Enemies hit by the explosion take damage. Enemies within the goo-filled area are 40% slowed and cannot use any movement abilities (e.g. charge, leap, barrel roll etc). > **(Passive) Washing Sin:** Franko has a heat meter instead of mana. Using abilities increase the heat meter that slowly taper down to 0 over time. Franko's abilities deal bonus damage based on how much heat was accumulated when casting them. When the heat meter maxes out, Franko's armor lets out an explosion, dealing massive non-lethal damage to himself and massive lethal damage all enemies in a moderate AoE around him. Explosion resets the heat meter back to 0. > **(Q) Fireblast:** Franko lets out a flame blast in a cone that damages enemies. > **(W) Explosive Fumes:** Franko tosses a noxious smoke bomb that damages enemies upon explosion and leaves noxious smoke to linger in the area for a little while. Enemies traversing through the smoke are slowed. If Franko uses an ability on the fume, it explodes, diminishing prematurely, dealing damage and stunning enemies. > **(E) Fire Dash:** Franko dashes a short distance, leaving a trail of Fire behind him. Enemies stepping in the flame are ignited, taking DoT damage (which stacks the longer they stay in the flame). > **(R1) Coolant:** Franko temporarily becomes super chill. During this time, the heat meter can't max out and Franko's next few non-heroic abilities do not go on cool-down. > **(R2) Stim Pack** Franko temporarily upgrades his weapons, such that all his abilities and basic attacks during this time ignite enemies (making them take stacking damage over time). > **(Passive) Colossal Being:** Freya can't mount and moves slower but deals increased damage to structures and is disabled for lesser duration. > **(Q) Sunbeam:** Freya casts a beam of light to rain down from the sky. It takes a short moment but upon descending deals decent damage in an AoE. > **(W) Nature Bomb:** Freya tosses a few nature bombs around her that explode for AoE damage after a little bit. > **(E) Touch of Eonar:** Freya instantly heals a portion of her health and mana based on the number of allied heroes surrounding her. > **(R1) – Colossal Stomp:** Freya stomps the ground, damaging and stunning all nearby enemies for a short duration. The damage is exponentially more based on the number of enemies caught in her stomp radius. > **(R2) – Summon Elders** Freya summons Stonebark (who damages nearby enemies), Ironbranch (who roots nearby heroes) and Bright Leaf (who heals Freya and the elders). These summons can be individually redirected by 1, 2 and 3 key or jointly commanded to attack or flee etc by the 4 key. > **(Passive) Wrath Shield:** Frydehr gains shield over time, more so if walking. > **(Q) Shield Bash:** Frydehr charges at target dealing damage based on how much shield is built up. > **(W) Judgment:** Frydehr slightly damages and roots nearby enemies for a short duration. > **(E) Fist of the Heavens:** Frydehr calls down a heavenly smiting on an area for insane damage after a short delay. > **(R1) Condemn:** Frydehr's begins to charge his fist with sacred energy. His next attack deals damage based on how long he was charging his fists. If Frydehr takes too long to punch someone, his charge expires. > **(R2) Consecration** Frydehr makes the ground sacred. Himself and all his allies are healed over time if they stay within the sacred ground. 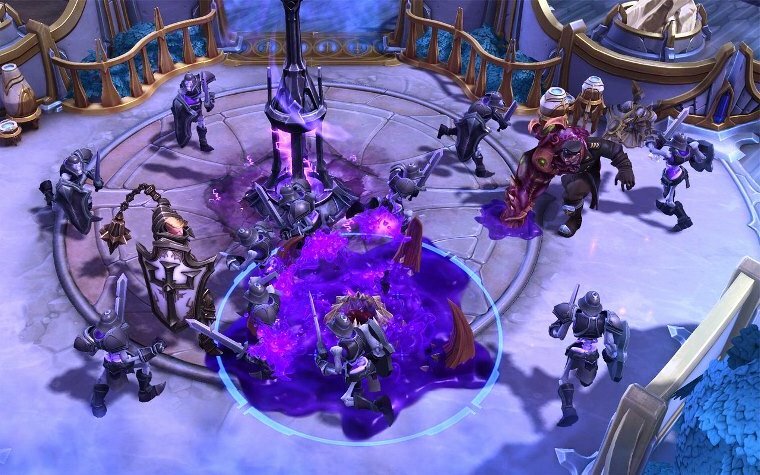 © Post "Suggestions of all F heroes" for game Heroes of the Storm.